Grandmas across the globe should take a bow: for those who insisted in force feeding their families a spoonful of cod liver oil every day, were, in fact, completely correct. Omega-3, the main beneficial fatty acid in cod liver oil, has been shown to reduce anxiety during exams by 20%, and improve working memory. And its' benefits don't stop there. Not that I am a great advocate of cod liver oil itself (I don't like the taste), but I do believe in the importance of taking Omega-3 supplements. While some people will stick to the good old faithful, there are now much more pleasant tasting options for people taking omega 3 supplements, ones that are more concentrated in the components that our diets are lacking, and also specifically tailored to the needs of each age group. Omega-3: why are we lacking it? Back in the days where we killed our own food fresh from the land and sea, our diets contained sufficient Omega-3. However since the advent of mass production and intensive farming of food sources, now our diets have become deficient. One of the reasons for this is that Omega-3 increases the speed at which food deteriorates, so farmed animals and fish are sometimes given food deficient in it. We can't produce our own Omega-3, so we are reliant on dietary sources for it. In the 1970s researchers noticed that despite having a diet high in fats, Eskimos (specifically hunters and fishermen and their wives) living in the West Coast of Greenland, had a very low incidence of cardiac disease and type 2 diabetes. By the 1980s, the spotlight was beginning to fall on a fatty acid, called Omega-3. It was discovered that the high levels of Omega-3 being consumed by the Eskimo population was acting to thin the blood and reduce blood clots forming. But this was just the tip of the Omega-3 benefit iceberg. The next 33 years of research into Omega-3 and its' health benefits have revealed a multitude of reasons why people should ensure they have sufficient Omega-3 in their diet, whether by increasing the amount of oily fish they consume (the prime source of Omega-3), or taking supplements of concentrated Omega-3. So what is Omega-3? And how much should I be consuming? Omega-3 is an essential fatty acid, that can't be made in our bodies, so we have to consume it. 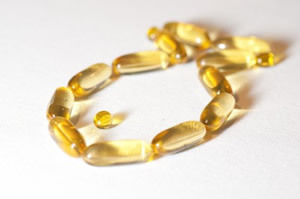 There are two active components of Omega-3: eicosapentaenoic acid (EPA) and docosahexanoic (DHA). Recommendations from recognized organizations, such as the American Heart Association, the World Health Organization and the United Kingdom Scientific Advisory Committee on Nutrition, are that fish (particularly oily fish) should be consumed at least once a week, with between 200mg-500mg of EPA and DHA being provided in each serving. Food sources of Omega-3 include: Fish, particularly oily fish, such as Mackerel, Herring and Salmon; Flax Seed Oil; Krill Oil. Cardiac effects: A huge number of studies have shown the positive influence increasing Omega-3 in the diet, it can reduce the clotting potential of blood which reduces the risks of heart disease. Omega-3 can also be helpful to reduce cholesterol levels, and reducing heart rate (which reduces sudden cardiac death). Brain Effects: Omega-3 (in particular DHA) can have a number of effects in learning, increasing concentration, and improving memory. ADHD can improve when Omega-3 is given to children long-term (for greater than 3 months) More recently there are documented studies which suggest that Omega-3 supplementation can help treat depression. Arthritis: The anti-inflammatory effect of Omega-3 can help to keep joints working for people with Osteoarthritis and Rheumatoid Arthritis. Asthma: As Omega-3 has an anti-inflammatory effect, it can improve asthma. Eczema: The anti-inflammatory effects of Omega-3 can also extend to reducing inflammation for eczema sufferers, and also help moisturise the skin. Omega-3 in Pregnancy: In pregnancy, the DHA component of Omega-3 becomes very important, and pregnant women and also children under the age of 5, if taking Omega-3 supplements, should look for one with a higher ration of DHA. Studies have shown that taking DHA during pregnancy reduces risk of premature births, and improves infant size. Prematurely born infants whose mothers have taken Omega-3 throughout their pregnancy also have better chance of survival. Omega-3 taken in pregnancy also seems to strengthen bone development in the unborn child, an effect which continues into early childhood. Omega-3 continues to assert itself in the world of nutritional supplements and health benefits, and will do so for many years to come, as scientists seek to fully understand how diet influences our health. In the meantime, listen to Grandma, and get back on to your Omega-3. OMEGA-3 SUPPLEMENTATION LOWERS INFLAMMATION AND ANXIETY IN MEDICAL STUDENTS: A RANDOMIZED CONTROLLED TRIAL. Janice K. Kiecolt-Glaser, Martha A. Belury, Rebecca Andridge, William B. Malarkey, and Ronald Glaser. Brain Behav Immun. 2011 November; 25(8): 1725–1734. LIPID METABOLISM, ATHEROGENESIS, AND HAEMOSTASIS IN ESKIMOS: THE ROLE OF THE PROSTAGLANDIN-3 FAMILY. Dyerberg J, Bang HO. Haemostasis. 1979;8(3-5):227-33. CURRENT EVIDENCE AND FUTURE PERSPECTIVES OF OMEGA-3 POLYUNSATURATED FATTY ACIDS FOR THE PREVENTION OF CARDIOVASCULAR DISEASE. Rizos EC, Elisaf MS. Eur J Pharmacol. 2013 Apr 15;706(1-3):1-3. OMEGA-3 FATTY ACID TREATMENT OF CHILDREN WITH ATTENTION-DEFICIT HYPERACTIVITY DISORDER: A RANDOMIZED, DOUBLE-BLIND, PLACEBO-CONTROLLED STUDY. Stacey Ageranioti Bélanger, MD PhD et al. Paediatr Child Health. 2009 February; 14(2): 89–98.